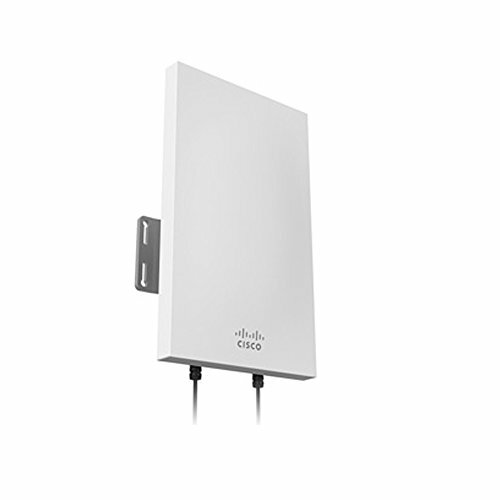 The Cisco Meraki MA-ANT-21 sector antenna is a 13 dBi, MIMO, 5 GHz antenna ideal for providing client coverage over focused areas or creating backhaul links. It is designed for use with Meraki APs that have N-type connectors. Designed for use with Cisco Meraki MR74 or MR84 5 GHz radios. The sector antenna can extend the range of a Cisco Meraki MR74 or MR84 device by focusing the wireless signal in a specific direction; the best way to establish a medium distance point-to-point wireless link. Extended Range: The directional antennas focus wireless signals in a particular direction by creating a co-polarization pattern. Typically, you'll be able to extend the reach of a radio by up to 2.5x in a particular direction. Easy to Mount: The antenna comes with everything you need for a pole or wall mount, and is suitable for indoor or outdoor use. 2 cables with N-Type connectors are integrated with the antenna. Improved Connectivity: Cisco Meraki's antenna accessories improve the reach and connectivity of a Cisco Meraki network by focusing and increasing signal strengths between MR74s and MR84s. Dimensions: 9.2" x 5.5" x 1.6" (233 mm x 140 mm x 40 mm). Weight: 1.2 lbs (527 g). Frequency range: 5.150 - 5.875 GHz. Polarization: linear, vertical / horizontal. Half power bandwidth / horizontal: 80.